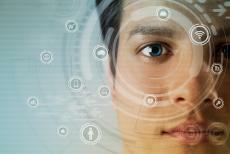 Canadian developers are taking the first steps toward developing a revolutionary "cyborg eye." Although this internal camera can't communicate with the optic nerve or brain yet, there's great hope for the future of this technology. Rob Spence, a Canadian documentary filmmaker, recently underwent surgery to put this digital camera in his eye. When Spence was a child he shot himself in one of his eyes by accident. This violent trauma caused his cornea to degenerate over time. In 2007, doctors were forced to remove Spence's cornea and replaced it with a prosthetic eye. Spence, who's now in his mid-40s, wondered whether or not scientists could add a camera to his prosthetic eye to help him in his filmmaking endeavors. So, he contacted Kosta Grammatis, a radio-frequency engineer, who agreed to help design a digital camera that's able to sit comfortably within Spence's prosthetic eye. Grammatis designed this wireless camera using a tiny battery, a micro transmitter, and, of course, a mini camera. He also made Spence a magnetic switch that allows him to turn the camera on and off. Martin Ling, a Canadian electrical engineer, lent Grammatis a helping hand in this eyeborg endeavor. Ling designed an intricate circuit board able to process the data coming into the camera and project it outwards using a receiver. This project was officially completed in 2008, but Spence only recently showed off his "cyborg eye" in public at the recent FutureWorld conference in Canada. Spence also has a website called Eyeborg Project where he shares the latest news on his digital camera eye. As mentioned above, this camera can't actually help Spence "see" the world around him since it's not connected to his optic nerve. Instead, Spence can record whatever is before his prosthetic eye in intervals of around 30 minutes. After 30 minutes, the camera has to be recharged. But don't worry, you'll always know when Spence is recording you or not. A red LED light glows whenever Spence decides to turn this device on. Spence believes it's a good thing others know when they are being recorded to avoid complex privacy issues. Other similar optical recording devices, such as Google Glass and Sony's prototype smart contact lenses, have given rise to numerous privacy issues. Of course, Spence is far from the first person to have various technologies implanted into his body. One artist named Neil Harbisson has a cybernetic eye that has allowed him to overcome his colorblindness. But perhaps the most famous "bionic man" is Professor Kevin Warwick of the University of Reading in the United Kingdom. Professor Warwick now has implants that allow him to open doors, change the temperature on a heater, and even turn on/off various lights in his home. Anyone can follow Warwick's amazing experiments on his website http://www.kevinwarwick.com/project-cyborg-2-0/. People who want to know more about Spence's "cyborg eye" should check out his official website at eyeborgproject.tv. There are numerous videos and Ted Talks on this webpage, and there's even a "Contact" page for people interested in asking Spence a question.